The Paper Database comes from fintime50, a scrapy spider project with the aims of scraping basic information of papers, authors, keywords from the journals of Finance Time 50. FMR uses the fintime50’s database as the raw data to train the LDA model， and, by the trained model, recommend the reviewers for user’s paper. This table represents entities such as journals, conferences and other sources from where papers come. In the table, publication_title is for journal or conference name. coverimage is for the journal’s cover image. home_url is the home web page url for the source. chief_editor, issn and description are also included in this table. This table consists of three parts. Basic information for the papers, such as title, abstract, first_page, last_page, pages, submission_path. submission_path indicates which year, which volume and which issue papers come from. Date and time about this paper, including publication_date, submission_date, online_date, revision_date, accepted_date. Index Information, such as full_url, cover_url, article_id, context_key. This is a one-to-many relationship between sources and documents. The attribute sources_id in table documents represents this relationship. This table consists of two parts. Authors’ profiles, which include last_name, middle_name, first_name, avatar. Authors’ information, which includes vitae, email, address, institution. There is a many-to-many relationship between documents and authors. In the database, the register table documents_authors represents this relationship. This table only contains keyword itself. There is a many-to-many relationship between documents and keywords. 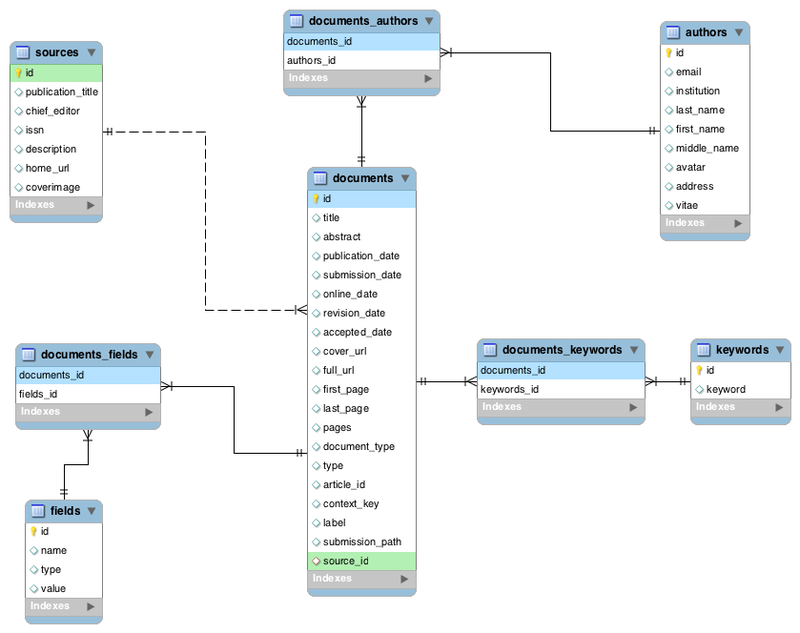 In the database, the register table documents_keywords represents this relationship. In this application, the database for the web app are seperated from paper-author databases. In most cases, you should not care about the web app database. There is only one table in web app database, namely RecommendationResult, which contains the users’ forms and recommendation results.